Thanks for getting on our case, Amy! 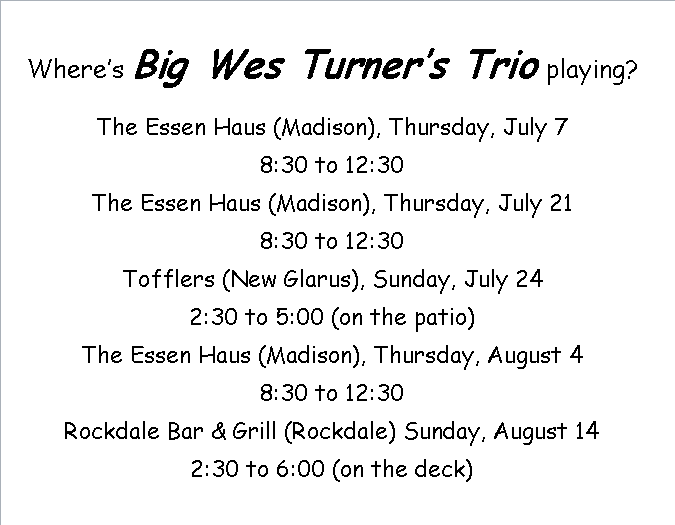 Of course, that's just the Big Wes Turner's Trio schedule. There IS more. 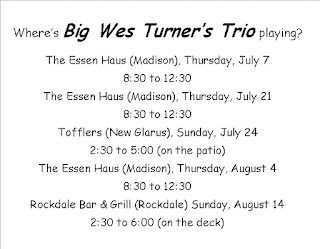 Tom joins the rest of The Midwesterners from 6 to 8 for a concert at Harriet park in Verona (then races across town for the BWT3 downbeat at the Essen Haus). On Friday the 8th it's late night "chamber folk" at Tempest (downtown on Doty) with singer/songwriter Paul Otteson's band, Faux Fawn. On Sunday the 10th Tom joins Frankie Lee and Mel Ford for a stripped down trio version of the The Maintainers on the deck at Rockdale Bar & Grill. Gary and Tom and the rest of the Birddog Blues Band play Tofflers on Saturday the 23rd, the night before Big Wes Turner's Trio takes the stage at Tofflers spacious patio.